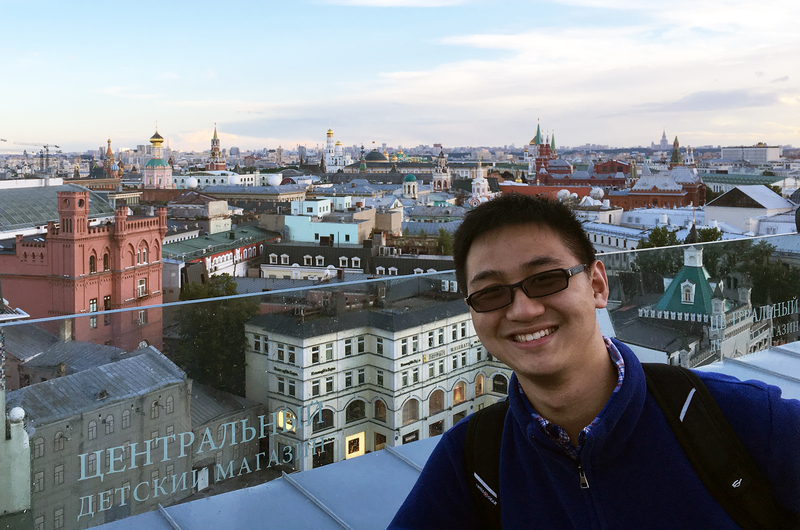 Studying abroad is a four-year adventure for Harry Qiu ’20, a native of Shanghai who’s wanted to study international relations since high school and is now learning his third language at Dickinson, while enrolled in the college's Russia study-abroad program. He discusses a favorite project—providing an officially recognized Chinese translation for a game manual, complete with his own illustrations—as well as his favorite class and professor, ideal dinner companion (Henry Kissinger) and his hobbies: flying a plane and practicing Russian martial arts. Chinese Student & Scholar Association, Russian Club and Dickinson Christian Fellowship. The Three-Body Problem by Liu Cixin. The silent section in the library and Russian House. I decided to pursue international relations while chatting with a friend of mine during a Model U.N. conference, when I was in 10th grade. The Russian major is something I never thought about before I came to Dickinson. I decided to take another foreign language (English was my first foreign language) after taking the online summer advising session before my first year. I didn’t want to learn a very popular language, so I had to choose between Arabic and Russian. Russian was my final choice because I could major in it. Then I declared a Russian regional focus for my international studies major. The Russian martial art of systema (Система). I also pilot an airplane. I am studying abroad right now [in Moscow, Russia]. Every step I make here (talking to waiters and passersby), every challenge I overcome (asking for directions, money exchange, etc.) is a highlight. HIS253 and HIS254, taught by Professor [of History Karl] Qualls. Professor Qualls plays a big role here. HIS253 is ancient Russian history until 1881. The topic itself was not that interesting to me (I am more interested in modern history, which HIS254 covers), but I learned a lot about the origin of the Russian culture, and I am now able to connect what I learned in this class to current Russia events. HIS254—Russian history after 1881—was even more interesting to me. I thought I had learned a lot about this period already, but Professor Qualls led me through perspectives I had never thought about. … a scientist, then a computer engineer or biologist. Then an international relations scholar or worker in the foreign ministry. Professor Qualls. He has an extremely large amount of knowledge of European history, especially Russian history, and he constantly adapts his syllabus to best suit the group of students he is teaching. His classes are not easy, and he kind of grades harshly, but I enjoyed every minute of them, and I learned a lot. He is also super available. Students can almost always reach out to him and talk about anything from academics to daily life or even martial arts! A Chinese translation of a game manual (around 60 pages with delicate illustrations, almost all done by me). It was recognized as the only official Chinese manual by the game developer. I spent a whole weekend on this project, and it earned me a lot of bonus points for HIS254 (although bonus points are not that important, of course). … there would be no evil person and no suspicion, and the world would be completely and genuinely globalized and liberal (but it’s impossible, so I maintain a realistic point of view). It’s a place where you can meet new people and pursue things you’d never dreamed of. Work for one or two years in the United States or in China and then go to a graduate school.